The top of the range mounted balefeeder, Chainless X2500 feeds every type of round or square bale and has been proven on more bale types than any other feeder and it minimises feed waste. It's self-loading with a patented, hands free quick hitch system, that makes connecting the feeding cradle to the headstock quicker and easier. A new tougher drive system eliminates downtime and is rated to handle 1250kg bales with ease. CHAINLESS No troublesome feed chains is a key advantage for -Reliability, lower maintenance and quieter operation, the teasing action of the rotors uses feed more economically, because it is easier for the cattle as they cna esit it because it is fluffed up. The Chainless X2500 can effectively feed out any bale type in both round or square. Chainless is a virtually silent feeding operation which means stock are more comfortable. SNAPLOX The patented, auto connect/disconnect self-loading system eliminates the twisting and strain on your back because there's no need to tug on a rope to disconnect, and eliminates the chance of a smashed rear window, should an inexperience operator forget to remove the rope when disconnecting. And it allows the feeder to be operated on a front loader, telescopic loader of skidsteer loader with ease. FEED ANY BALE The new rotor shape and bale chamber design has better penetration on tight bales, frozen bales and square bales and the shape cleans sticky bales better. A patented new Axial rotor has more grip on sloppy, rotor cut bales which makes feeding them out easier and more efficent and centralizes the bale in the feeding chamber, reducing wastage. 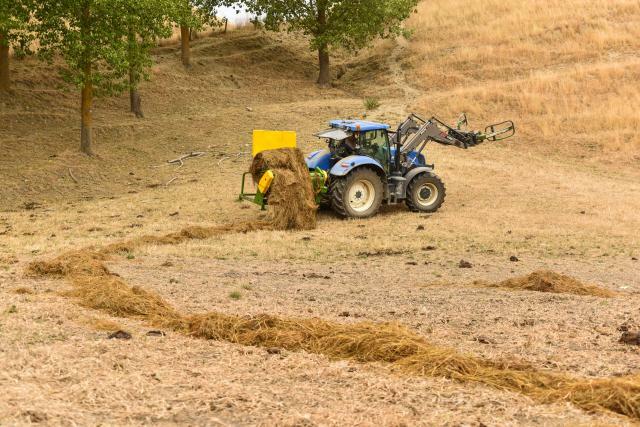 The larger bale chamber makes it possible to feed out a wider range of bales, and makes using the X2500 very simple for operators of all skill levels and reduces the need for platform adjustment. EASY CLEANING The new Easy-Clean Hypaflo wiper panel -The newly developed wiper panel that clears the hay from the rotors better. It has a new quick release latching system for releasing the panel to clean out any hay. NO BUSHES Bushes in the drive system are one of the highest cause of frustration in maintaining a bale feeder. We are pleased to announce that the entire drive system on the new Chainless X2500 runs on bearings, for lowest possible maintenance, less downtime and longer service life.